This story first ran in The Cedar Rapids Gazette on July 1, 2017, and can be found here. VINTON, IOWA — About 30 miles northwest of Cedar Rapids lays a small community nestled along the banks of the Cedar River. Vinton, home to some 5,000 people, is reminiscent of many small towns in Iowa. It has a traditional downtown, filled with a few square blocks of two-story tall redbrick buildings, streetlights and American flags. It has a local high school, Vinton-Shellsburg, which boasts a student count around 500. And, like nearly every Iowa town, it is surrounded on all sides by miles of cornfields. It’s a true farming community, not unlike many other towns in Eastern Iowa. Yet once each week as the summer sun starts to set, Vinton transforms. It’s not just a small town anymore. The Benton County Speedway, sitting between the high school and elementary school, is a quarter-mile dirt track — one of the last true dirt tracks in its corner of the state. And on every Sunday night in the summer, the old metal grandstand at the speedway is full, packed with locals wanting to catch the plethora of different races held each week. Vinton isn’t just a small town. It’s a racing town. Every Sunday from April through August, JJAM Racing puts on some eight classes of racing, depending on the night and the turnout. Drivers from all over the state — and even the country — flock to the track to get the opportunity to compete on dirt, something not often available to them. Brad Chandler, a Cedar Rapids native who won the Sport Campers class on June 18, said it’s the local draw that truly keeps the track successful. It’s not just small tracks struggling. Across the United States, auto racing is in decline. NASCAR is losing popularity, and many tracks have even been reducing seating capacity simply because they can’t fill it anymore. Bristol Motor Speedway in Tennessee, one of the iconic speedways in the country, couldn’t pack its stands for its two annual NASCAR races last year, yet set an attendance record when it hosted the Virginia Tech-Tennessee football game. Television ratings have plummeted, too. Only a little more than 6 million people watched Jimmie Johnson win the 2016 NASCAR Championship last season, a 20-percent decline from the year prior, according to Sports Media Watch. Former Sports Illustrated and ESPN.com journalist Ed Hinton, who covered NASCAR for years, told The Guardian in 2016 that he doesn’t think the sport can recover from the hit it's taking. “Finally (NASCAR) actually became what critics have long called it: just a bunch of cars going around in circles,” Hinton told The Guardian. The trend with NASCAR isn’t just a national one. Many small tracks around the country have taken a hit, too. They’ve seen their attendance numbers drop, and many have quit holding races as frequently as they used to. Many small towns just don’t see success at the racetrack anymore. Yet Vinton doesn’t seem to have that problem. 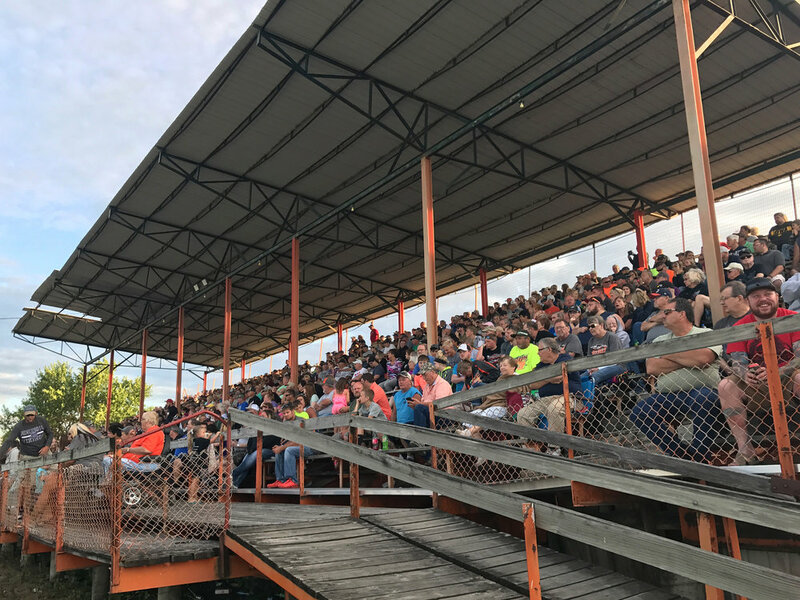 The speedway, which has been around for decades, has thrived, hardly struggling to fill its races with drivers — or its grandstand with fans. The nationwide decline isn’t a problem. The 23rd annual event is held each year around Independence Day, and always draws a huge crowd. One would need to show up at least an hour early, Van Genderen said, to even get a seat in the grandstands. Throughout the five different classes being run this Sunday night at 6, racers have the opportunity to win a larger prize. In the modifieds class, it’s possible to win over $5,000. Many other promotional activities are held, too, which Engledow said really helps that race to stand out and draw a big crowd. “Everybody can contribute to the racer, like in the micromods you can put how much ever you want,” Engledow said. “If you put $100, you can put it all on No. 1 and he gets it if he wins, or you can divide it down. Everybody just gets a little more money in the pot ... it’s things like that that people like to come to the Hogan Memorial. It’s one of the biggest things here, and the town really supports them for that." And while Vinton will be packed this weekend for the Hogan Memorial, it’s not the only time the community steps up to support the racetrack. Many restaurants will change their hours on racedays, staying open late for drivers and their families so they can get food or drink after the races. The town often holds fundraisers at the racetrack, too, supporting local groups or families who have found themselves on hard times. So while many small-town racetracks are struggling, the Benton County Speedway is not one of them. Vinton is making sure that it survives.